Wow! That's what women say when they put on these extra-special fur lined gloves by Fratelli Orsini, because there is nothing like the cozy feel of so much rabbit fur embracing your arm. 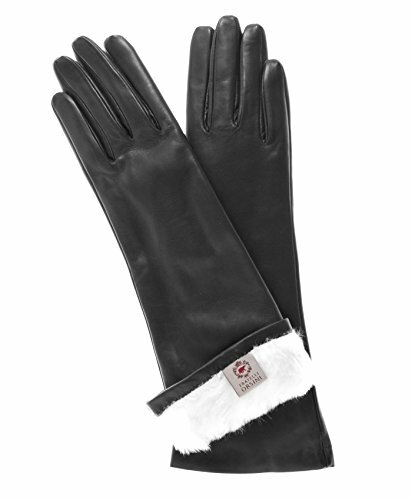 For those who like restrained elegance, these extravagant long gloves (six inches up the arm) are completely lined in pure white rabbit fur, subtly encasing your hands and forearm in furry luxury. Their smooth and beautiful lines are perfect for all dress occasions, even the opera. This classic dress glove style has no buttons or vents exhibiting the unmatched craftmanship of the designer Italian artisans at Fratelli Orsini. The luxurious white rabbit fur lining extends to the finger tips and wraps your hands in softness, keeping you warm in the coldest of winter weather. Made in Italy by Fratelli Orsini. SIZING HINT: These gloves run true to size.